This is an update on availability of our book The Style Guide - with the sweet sweetener of an extract from the Accessories chapter. So far, The Style Guide has sold just over 1000 copies, out of a total run of 2000. So they're going pretty fast - you can buy online now in the Shop section of the website. The following have also re-stocked in that time: The Armoury New York, Skoaktiebolaget, Pauw Mannen and Shibumi. See the bottom of this post for a full list of stockists. In fact, Shibumi in Florence just re-stocked this week, so anyone travelling to Pitti Uomo next week can pick up a copy at the Shibumi showroom. In other news, we will be hosting a dinner in London in a couple of weeks, for many of the stars of the Guide. We will produce a film as part of it, around the theme of men's style, so look out for that. And on the subject of the stylish stars of the book, here are three of my favourites from the Accessories chapter, along with my notes on the things I find instructional about each. So much colour – strong colour – with pattern and texture, and yet to a certain extent it balances. 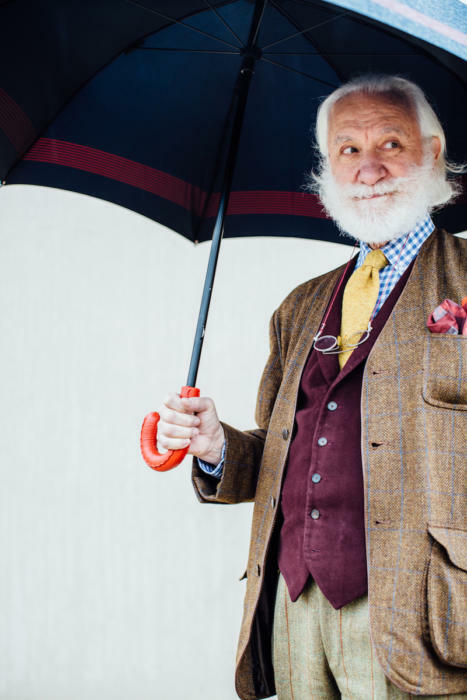 Shirt, jacket and handkerchief all have big patterns. Tie and waistcoat are strong plain colours. Even the handle of the umbrella is something to draw the eye. Orange works well against a navy suiting, particularly if it is not too bright. 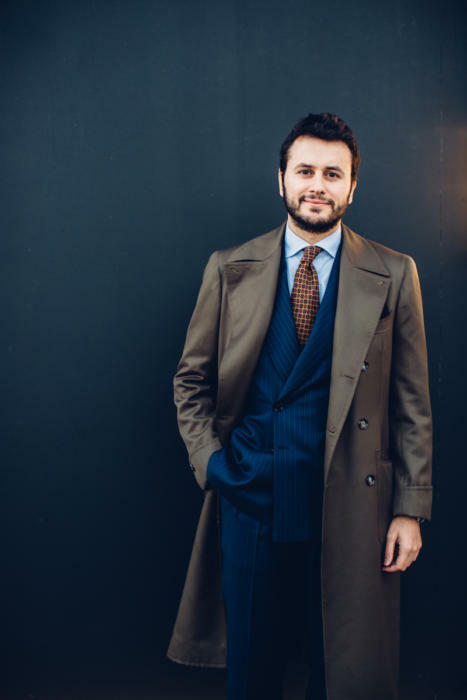 Although the tie’s pattern is similar in scale to the suit’s pinstripe, they are effectively separated by the plain shirt. 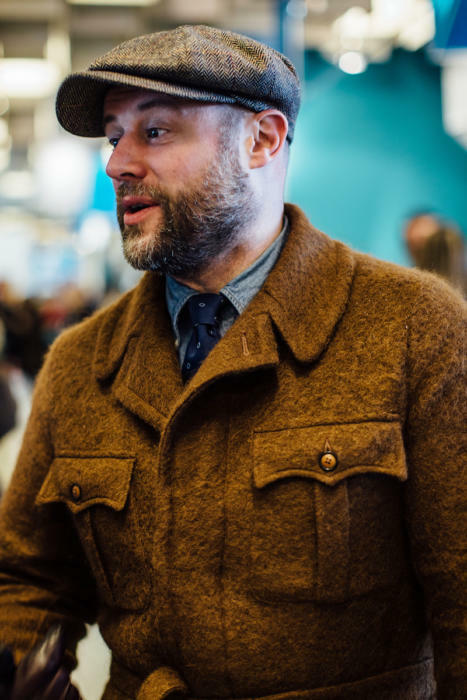 The brown coat, particularly with sartorial details like the sloping collar line, stops the overall look becoming too conservative and corporate. Great, heavy texture. The woolliness and colour of the jacket draw you in, the cap and shirt provide effective foils. Also nice variations in texture that could work equally well in more formal outfits. The shirt and tie, for example, are standard sartorial colours, but with a casual finish in the denim shirt. Tony's cuff and vintage watch are shown in the header image. You can follow the discussion on The Style Guide: accessories style, as more stockists announced by entering your email address in the box below. You will then receive an email every time a new comment is added. These will also contain a link to a page where you can stop the alerts, and remove all of your related data from the site. Francesco Maglia….I ordered a real nice brolly from Mr. Porter and the thing leaked. Returned it and got a Brigg which only leaks during heavy downpours. *Sigh* my cheapo umbrellas that I bought from street corner vendors do a better job at repelling rain. Simon, where’s a good place to pick up a denim shirt for wearing with a tie? I’d ideally like a good collar stand. Would you always recommend bespoke? I am struggling with which wrist to wear my watch on. Its normally on my right wrist, but sometimes on my left if I’m wearing a sweater or lace ups. Are there any rules you can suggest? I’m struggling to find RTW denim shirt to be worn with a tie, pointers please? I would love to go bespoke, however, budget wise, I can’t afford it presently. You forgot to add Pauw mannen (amsterdam, The Netherlands) to the stockist list. Four star post, Simon. Wish I had this list a year ago. What jacket / coat is Tony wearing in the last photo and where can I get one? !